Lenovo hopes that computers made in its first U.S. manufacturing facility will attract more buyers, while also making the delivery of ThinkPad laptops and tablets faster to U.S. customers. The company, which is based in China, earlier this month announced it would open a factory to make computers in Whitsett, North Carolina—its first such facility in the U.S. Lenovo said the factory would create about 115 manufacturing jobs and a spokesman later added that the company may expand the facility in the future, which could create more jobs. Manufacturing in the U.S. will help Lenovo get its products to customers more quickly, said Peter Hortensius, senior vice president of the product group at Lenovo, in an interview at a company event in New York this week. The company will manufacture ThinkPad laptops and tablets starting early next year, and with the new factory, Lenovo hopes computers could reach customers within a week, or in some cases, overnight. But initial supplies of products like the ThinkPad Tablet 2, which will become available in October, will not be made in the U.S. factory. Many Lenovo computer shipments originate from China and are supposed to reach customers in 10 days, but in some cases take weeks. The company also has factories in Japan, Brazil, Germany and Mexico. The “Made in USA” tag on computers manufactured in North Carolina will resonate with some buyers, Hortensius said. Lenovo’s main U.S. operations are in that state, and the company also has a distribution center there. “We decided the time was right in the U.S. because what we gain is speed. We’re really close to the customer. We can provide services and customizations that frankly if I’m doing it an ocean away it’s hard to do that,” Hortensius said. But the quicker delivery of laptops or services may depend on what the customers are willing to pay. Components are made and shipped from other countries, which could increase the cost, Hortensius said. “The reality is if you take this [laptop] apart, you’ll see parts from everywhere. Designed in different places, built in different places. It’s a very international, very Asia-based supply chain, no doubt about that,” Hortensius said. However, the company has taken that into account. “You have to make the thing make sense economically on its own. We think we have a way to do that, and as we wrap that factory, we expect to be able to show that,” Hortensius said. Lenovo is the world’s second-largest PC maker behind Hewlett-Packard with a strong market presence in Asia-Pacific and Europe. The company has been growing in the U.S. on a distribution channel expansion in recent years. The company is also trying to adapt to regional trends when building computers, Hortensius said. For example, in Germany and China there is a big demand for discrete graphics cards, which is not the case in the U.S. Lenovo has also launched smartphones in countries including Russia and China, but has no plans to launch handsets in the U.S.
Lenovo earlier this week launched a range of hybrid devices that function as both a PC and a tablet. 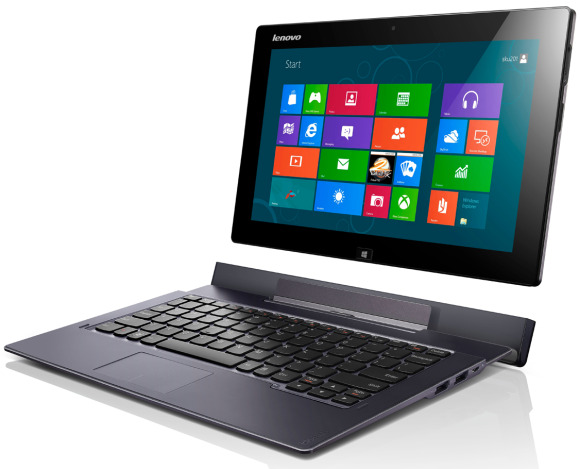 The devices are based on Windows 8 and RT operating systems, which will ship in computers later this month. Lenovo is also building up its cloud service to supplement the new devices. The company talked about its cloud service in January this year and in mid-September acquired Stoneware to boost its cloud computing offerings. The products offered by Stoneware are similar to the cloud capabilities being developed by Lenovo, Hortensius said. Lenovo’s cloud service will have two elements: one tied to calendar, contacts and syncing, and the second tied to accessing applications in the cloud from any device via a browser interface. The Stoneware program is similar to Lenovo’s products under development, but smart enough to know where the content is, and to take advantage of local device resources such as a graphics processor. “We’re very excited,” Hortensius said.